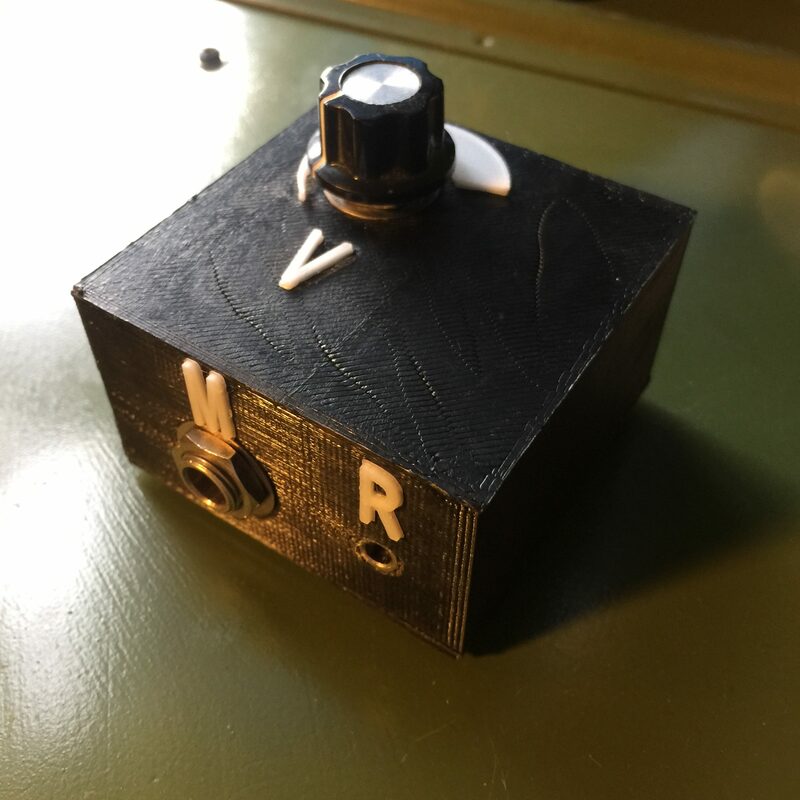 3D print and a $3 buck converter! 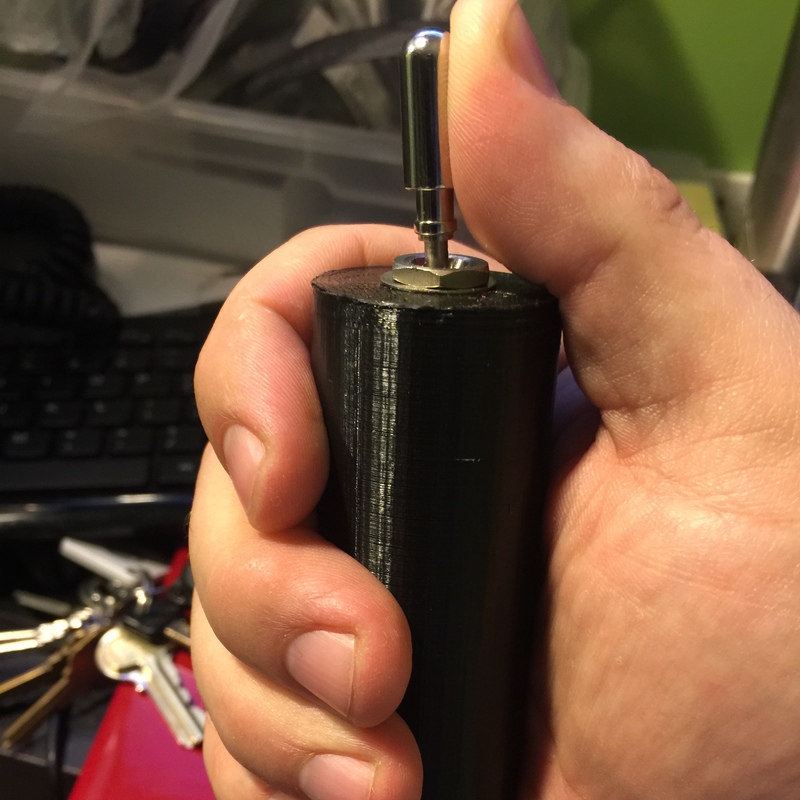 While I was printing 18650 battery cases for my Baofeng and my Yaesu HTs, I was wondering what would happen if I built a regulated linear power for my Baofeng so I could run it from 12 volts. 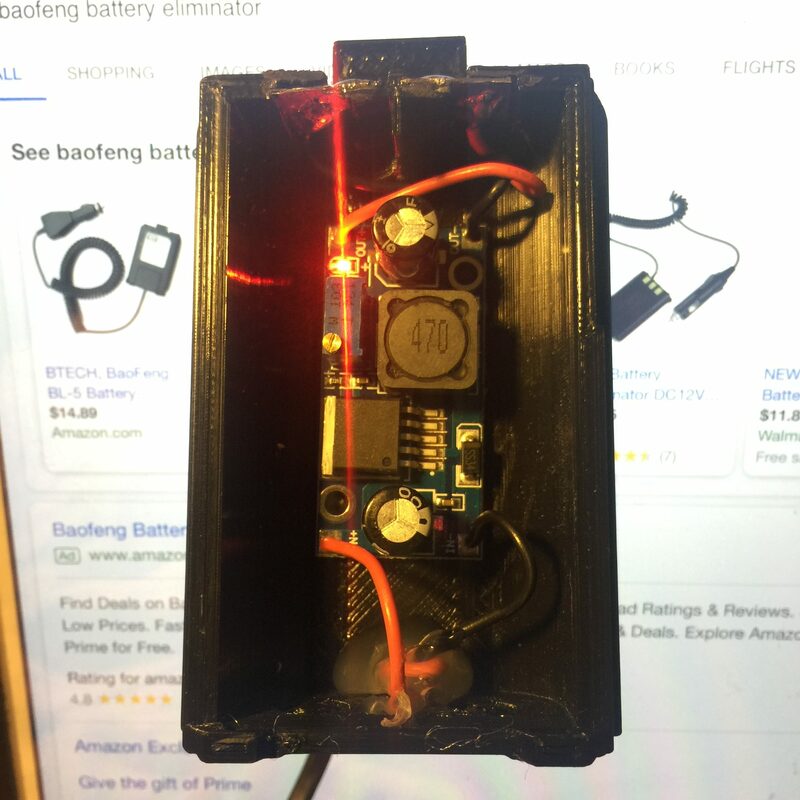 (You can buy a battery eliminator for about $14, but you’ll still have to cut the cigarette lighter adapter off to use with some other connector.) Back to the DIY…I did some rough math in my head and decided that a linear supply would be a waste of energy in heat that I didn’t want. PLA melts at a low temperature AND I was wanting to use the radio in a battery powered ARDF fox box so power consumption conservation is paramount! 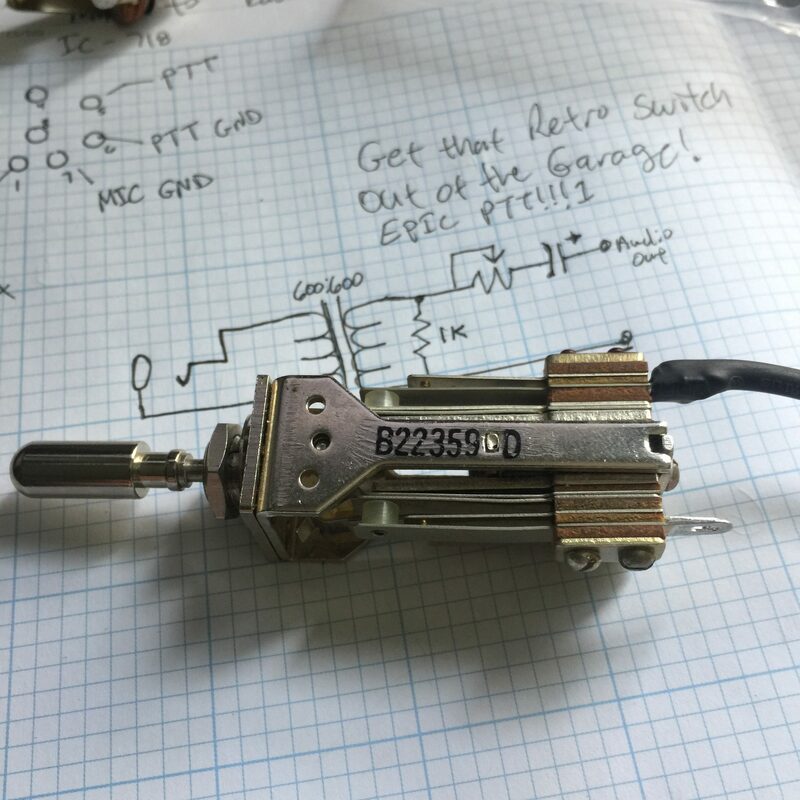 I decided I’d look at building a switching DC-DC buck converter which is about 100% more efficient compared to a linear supply (about 90% efficient overall). After looking at the easy schematic, I quickly realized I could probably get one cheaper than the sum of the parts and shipping. Off to eBay I went. I was not disappointed. You can either buy them in bulk from China for about $5 or you can buy one from a guy in Georgia for $2.75. I’ve included the edited screen shot from eBay. Shipping is fast, and I am very pleased. I’ve bought two from the seller because I reversed the leads on the first one and burned it up. Hint: WATCH YOUR POLARITY! These are not forgiving. All I had to do then was connect the wires! I chose to use a barrel connector on the back because of the power splitter I’m using in the fox box. I’m usually a fan of Anderson Powerpole connectors, but this time around I chose something different. The input and output polarities are clearly labeled on the circuit board. You need almost no electronics knowledge to make this work! Just watch your polarities. Finally, you hook it up to a 12v supply and turn the little potentiometer until the voltage is where you want it. I chose 7.4 volts which is the nominal Li-ion battery voltage. I’ve been watching videos of guys on ham radio operating (especially some of the guys on the 3.916 nets), and I’ve been wondering how to hook a “regular” microphone through a mixer to my radio. I watched a video by Bob Heil that did a good job of explaining how to do it (LINK). Then I watched a video of why you would want to do it (LINK). I had all of the parts to build a solution in my junk bin! The first thing I learned was something I basically already knew; I needed to isolate the mixer from the radio using an isolation transformer. I prefer this method so that there are not any ground loops. Back when Radio Shack was alive I purchased two of them to use as a digital interface for my 10m rig. I since upgraded to a SignLink to do that work so the DIY interface went into my parts bin. This switch looks too cool! I started my research by looking at some available interface schematics on the web. There were several designs that used chokes, but I decided that I didn’t want to do that. 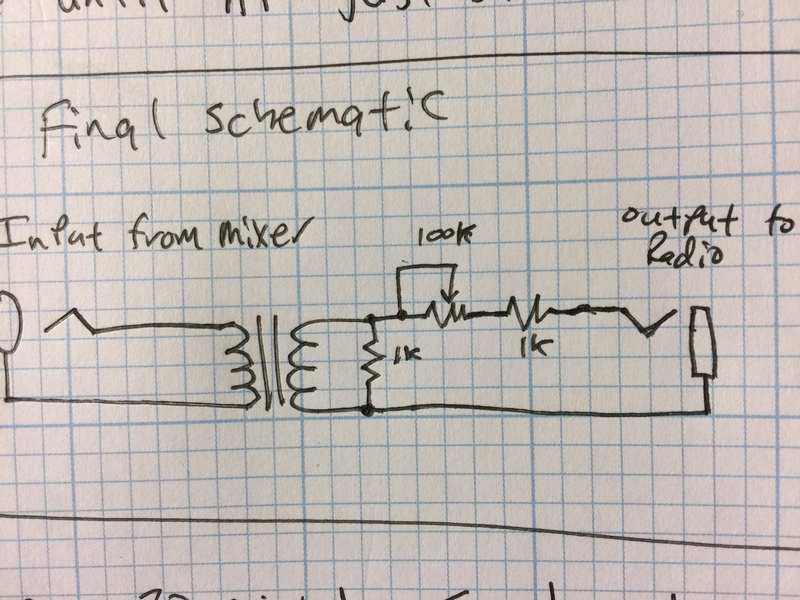 I drew up a schematic in my engineering notebook with a circuit board and box idea. The circuit is quite simple. The 600:600 transformer connects one side to the input jack that comes from the mixer. The other side of the transformer connects to a potentiometer and two resistors. Then the output is fed through another audio jack to the radio. Another momentary switch is used as the PTT. Look at the picture of this switch! It’s from another man’s junk bin. Free and awesome looking. I added some printed lettering to show what each jack was for. I really like how the volume indicator turned out! I designed a box to house it in using Tinkercad.com and used my 3D printer to create the box and switch case. Wiring it up was easy. I tested it out on a net the other night before it was put in the box, and audio reports came back good. It works. 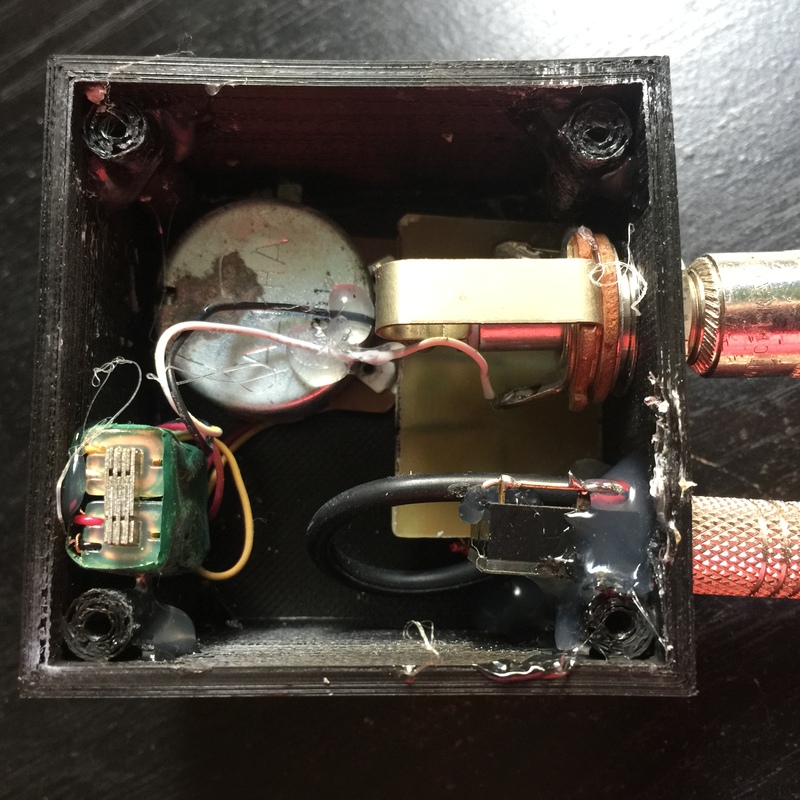 I don’t have another receiver to listen to it, so I cannot give any info as to how my actual sound “sounds”, but I know that the interface works! This switch can also be modded to hold in the on position. It is mom-off-on, but I left the on section unwired for now. with the PTT switch since I wired it straight to the radio. There’s no picture of the plug to the radio. If you’ve seen one you’ve almost seen them all. What sets my kit apart is this switch. Good night! I love how it looks. I’m pretty sure that is an aircraft switch. I threw most of the crap that I inherited from a guy, but these switches looked too cool to toss. I have more, and I’ll probably do this again for something else! I’ll leave you with an image of the inside of the box, and an image of the schematic. This was a fun build, and I look forward to using it on the air. The Santa net on 3.916MHz starts tomorrow, so I know the kids and I will be using it. Some upgrades in the future will be a mixer that actually has the right EQ as mentioned in the videos. My main goal was the get where I could actually use my Shure SM-58 and the mixer. Now I can look to upgrade. Perhaps I’ll own a Heil in the future!!! This schematic is bare bones. You could add filters or beads for RF if you needed them. I added clip on ferrite chokes on the audio cable to my radio (just in case). It’s a tight squeeze. I promise that I planned it that way.